Well, it's that time of the year again! Another peril that the festival brings along is the sacrifice of owls to please Lakshmi, the goddess of wealth, which is again a paradox considering the fact that the owl is recognized as the vaahana or mount of the goddess. Please remember that this practice is a criminal offence. Let's celebrate Diwali 2013 like a festival should be celebrated. 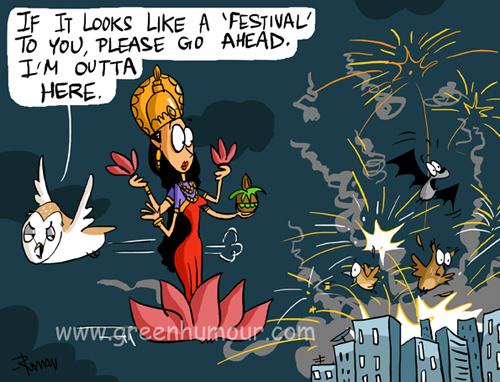 Have a cracker-free Diwali.